The most comprehensive, user-friendly upholstery book on the market just got better! 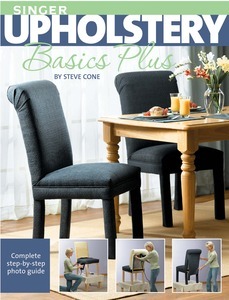 Over its lifetime, SINGER Upholstery Basics has sold nearly 150,000 copies. Now, with five new projects and an entirely fresh presentation, SINGER Upholstery Basics Plus is truly the best book for beginners and seasoned upholstery buffs alike. All the basic upholstery techniques are taught. Projects include all styles of chairs or couches, stools, different styles of ottomans, a bench, and a headboard. Some projects are built-from-scratch items that require only simple carpentry skills for building the frames. Others show the complete process of stripping, repairing, and reupholstering old furniture pieces to like-new condition. Large color photos of the step-by-step instructions set this book apart from all the others.